Green Fairy Quilts: I've been quilting like crazy! I've been quilting like crazy! This is a customer quilt that I finished over the weekend and I think it turned out nice. I have the custom quilts lining up and it's fun because I get to make each quilt different. I had forgotten how fun straight lines are, but they really are time consuming since there is so much stopping and starting. I love the end product and it was a joy to work on. Terri at Scrap Apple Quilts put it together and she is an awesome piecer! The quilt was so straight and every Long-Arm quilter knows how important that is. Make sure to check out this weeks "Deal of the Week!!" What a beauty!! Great job! The quilt is lovely, but your quilting is gorgeous. I love the quilting in the border and yes a strait quilt is so important. That is one gorgeous quilt...I love your quilting...it really makes the quilt! I'm just an hour south of you in Logandale, Nevada, too! 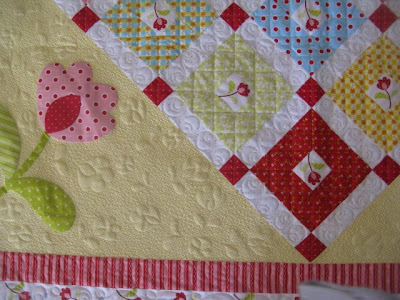 cute quilt and good quilting! I love the quilt and I love how you quilted it. Beautiful quilt: lots of work. such intense quilting. 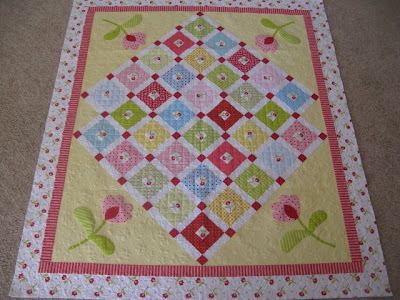 Wow ....I hope I get to do quilting as good as you one day :) Its just gorgeous!! 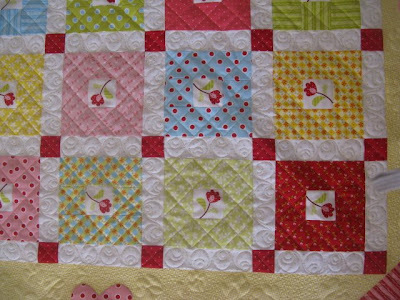 Yep...love to get straight quilts with perfect borders! :-) I hear ya! Your quilting is fantastic and really made this top sparkle. What a pretty quilt! Your quilting is wonderful!